The coat of arms in the upper right of the painting identifies the subject as Major Thomas Savage. Identical to the arms on his tomb slab at the King’s Chapel Burying Ground, the armorial device belongs to the Savages of Rock Savage and Clifton, Cheshire, England. It consists of six sable lions on an argent (silver or white) background, surmounted by an ocher (yellow or gold) “crest out of a coronett” below a sable lion’s paw. Surrounding the crest is a jagged mantle, representing a torn soldier’s cloak. Crests of this type were “best ascribed to souldiers and to such whose titles are military, as Lieutenants, Captaines, Majors, Colonells, Marshalls, Generalls, Knights, Banneretts, &c.,” according to Randle Holme’s seventeenth-century encyclopedia of heraldry. Major Thomas Savage is a visual record of one of the most important military and civic leaders to emerge in Boston during the colonial period. Thomas Savage (about 1606–1681 or 1682) embarked on the ship Planter from London in April 1635, having trained as an apprentice in the Guild of Merchant Taylors of London. Listed as a tailor on the ship’s passenger list, he was made a freeman of Boston within a year of his arrival and engaged in a variety of occupations in New England. Records show Savage keeping his cattle on property owned at Muddy River (now Brookline), purchasing farmlands in Braintree, operating as a merchant in Boston, and becoming part owner of the Saugus Iron Works. His will, dated June 28, 1675, disposed of property totaling nearly £3,500, an enormous sum in an era when the average estate of the wealthiest Bostonians averaged £600. Savage fathered seven children by his first wife, Faith Hutchinson (about 1617–1651 or 1652), and ten children (only four of whom lived beyond childhood) by his second wife, Mary Symmes (1628–1710). As early as 1637, Savage provoked government authorities by defending his mother-in-law, Puritan dissident Anne Hutchinson. At her trial Savage argued, “My mother not beinge accused for any haynows fact but only for opinion … I cannot consent that the church should proceed yet to admonish her for this.”Mrs. Hutchinson, convicted of heresy for her testimony concerning her direct revelations from God, was banished from the Massachusetts Bay Colony. Savage also left the colony and, along with William Coddington, William Hutchinson, and others, purchased Aquidneck Island to begin the settlement of Rhode Island. By June of 1638, Savage had returned to Boston and joined the town’s militia force, the Ancient and Honorable Artillery Company, serving as captain in 1651, 1659, 1668, 1675, and 1680. In 1675, at the outset of King Philip’s War, he was appointed chief commander of the Massachusetts forces and led an attack on the Indian sachem at Mount Hope (now Bristol, Rhode Island). Savage had also contributed to the colony’s protection in 1673 by helping to erect a barricade in Boston Harbor to protect against Dutch attack. The view from the window in the Savage portrait, onto Boston Harbor and Beacon Hill, may represent a synthesis of these high points in his military career. These topographic views may be the earliest surviving representation of these locations. Savage was also a civic leader, beginning in 1652 as town clerk and selectman. Chosen to represent Boston in the General Court from 1653 or 1654 to 1657, from 1659 to 1662, and from 1677 to 1678, he held the office of (court) assistant during the last two years of his life. Savage was also a founder (1669) and member of the Third (Old South) Church. Thomas Savage’s age at the time of this portrait—73, as given in the inscription—is partially apparent in his attire. The falling band with rounded corners, popular in England between 1640 and 1670, was the fashion of his youth. By 1670, shoulder-length hair had been replaced by curled wigs, yet Savage maintained conservatism in the face of change. The buff, or heavy leather coat, and shoulder knot, however, were current with contemporary military dress. 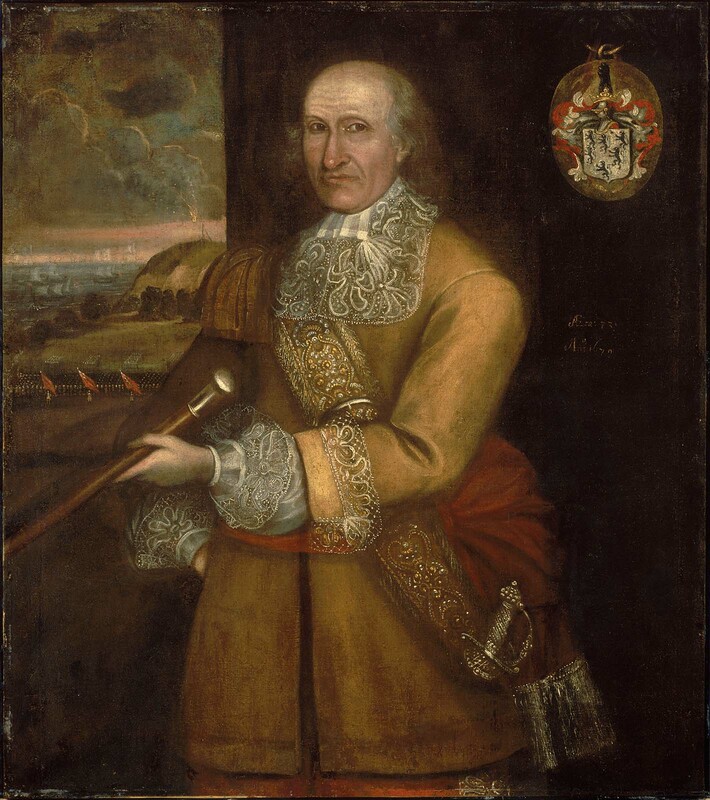 The coat, baldric, and sword suggest Savage’s activity in the colonies during King Philip’s War and ensuing years. From the detailed record of Savage’s military service and position, which appears to have precluded the possibility of travel and therefore of a portrait painted abroad, scholars conclude that the painting was executed in Boston. In any discussion of painters active in seventeenth-century New England, Major Thomas Savage is a pivotal work, linking together several other portraits: Mrs. Richard Patteshall (Martha Woody) and Child [1994.255], Captain Richard Patteshall (private collection), Elisha Hutchinson (Harvard University Portrait Collection, Cambridge, Massachusetts) and Captain Thomas Smith (Worcester Art Museum, Massachusetts). This group of closely related canvases clearly indicates the presence of a skilled artist in the area, a painter influenced more by Dutch and Flemish realism than by flat Elizabethan decoration. Savage is positioned with his head turned slightly to his right; his left shoulder is forward, with his body at a forty-five-degree angle from the viewer. Contemporary writers on portraiture prescribed this “contrapposto” positioning, but the stock pose in no way distracts from the artist’s characterization of his subject. Demonstrating a clear understanding of linear perspective, the artist has made the far eye slightly smaller than the near one, and the value of the whites deeper than the flesh tones. The Savage portrait appears to have descended through Savage’s daughter Sarah, wife of Colonel John Higginson, to William H. Spooner, a nineteenth-century descendant. Colonel Henry Lee, also related to Savage, purchased it from Spooner before 1880. From Lee, the portrait passed into the possession of his daughter, Mrs. Frederick C. Shattuck. Mrs. Shattuck bequeathed it to her son, Henry C. Shattuck, who left it to the MFA. 1. Randle Holme,An Academie or Store House of Armory, vol. 2 (Chester, England, 1682; repr., London, 1905), 322. 2. 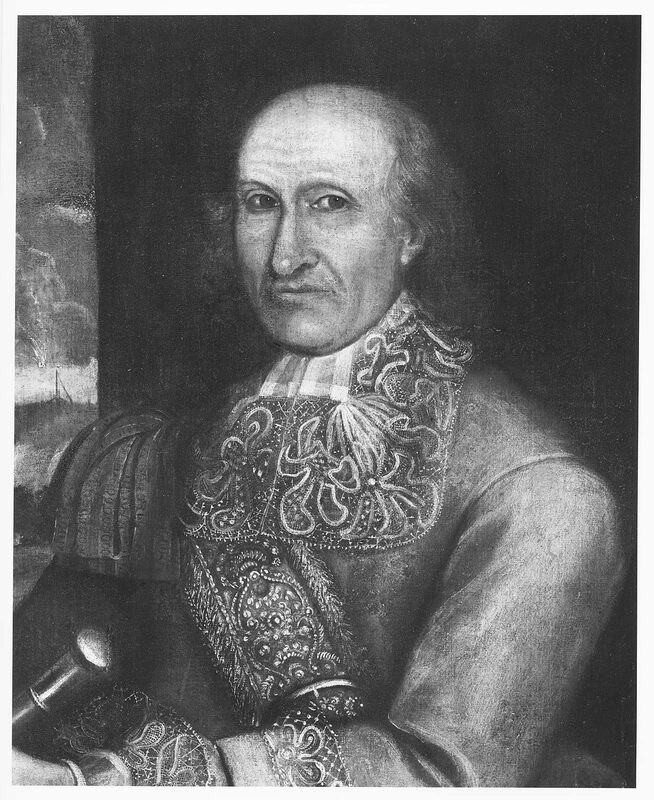 Charles Knowles Bolton, The Founders: Portraits of Persons Born Abroad Who Came to the Colonies in North America Before the Year 1701 (Boston: Boston Athenaeum, 1919–26), 463. 3. See, for instance, John Bate, The Mysteries of Nature and Art, 2nd ed. (London, 1635). This text was adapted and expanded by Cody Hartley from Jonathan L. Fairbanks and Robert F. Trent, New England Begins: The Seventeenth Century, vol. 3, exh. cat. (Boston: Museum of Fine Arts, 1982).